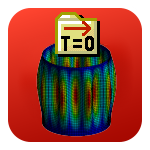 The Initial Deformation app can map deformed results from multiple environments as an initial condition in a structural nonlinear (buckling) or thermal analysis and automatically calculate the needed scaling factors for the results mapping. In Workbench a Solution cell may be linked to the Model cell with a scaling factor to use a deformed mesh in the analysis. This will break the link for Geometry and Model as well as for contact and remote points. If updating the source model, the same modifications must be applied in the target model. The app can apply an initial deformation without breaking the link for Geometry and Model. This will allow to keep a shared model setup for contacts, joints etc. Modifying the initial deformation is done without having to update the linked Model cell since the deformations are mapped when solving the model. In case of updating the setup in the source analyses, e.g. Static Structural and Eigenvalue Buckling, the linked nonlinear buckling with initial deformation is also updating the scaling factors when re-solving.